Asynchronous or Synchronous? Which do you prefer? When I consider my experiences as a student, I much prefer asynchronous communication tools. This is not because I am an introvert, but rather due to my work schedule. I work with international higher education faculty. I teach them how to develop accelerated online courses and train them how to facilitate the teaching and learning process using technology. Due to timezones, I am online with faculty on the other side of the planet at times when my classes are meeting online. 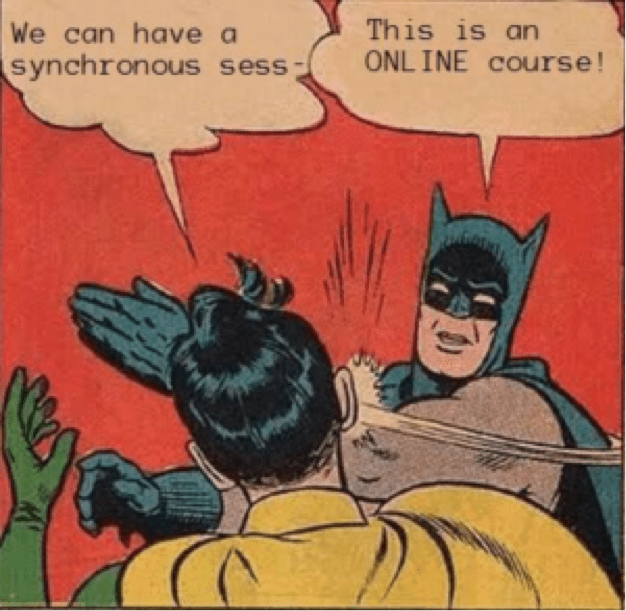 I have also had terrible experiences with synchronous sessions as an online student. A terrible synchronous event is worse than a bad asynchronous course. A student can muscle through the content in a poorly designed asynchronous course by asking questions of the instructor or other students. But, when students are all forced to be online at the same time or face grading penalties and the experience does not meet expectations (value for their money spent on the course) then the course is better left to asynchronous tools. It is true that synchronous learning decreases transactional distance if it is done well (Offir, 2008). However, there are some important things that the instructor needs to understand in order for synchronous learning to improve the overall student experience. creates a sense of community in the course. holds students accountable for the work they are doing by using Socratic questioning techniques. comes to the synchronous class with an agenda and sticks to it. creates opportunities for breakout groups to work on tasks and come back to share (ex. jigsaw activity). does not change the meeting dates and times after they are set. gives students a voice so that it is not a one-way delivery of information (“he who teaches learns”). Synchronous teaching is more complicated than teaching asynchronously and requires different skill sets. In order to be effective as a synchronous instructor you must have proficiencies in the tools, the content, and be confident presenting in such a format. Bower 2011 defines the competencies required as: operational, interactional, managerial, and design competencies (p. 79). 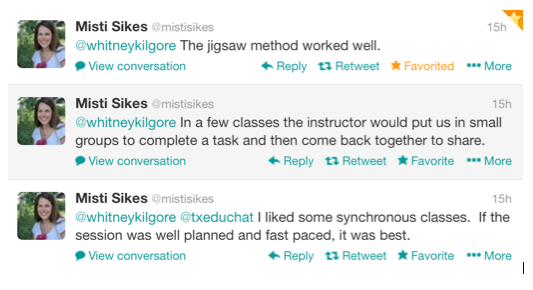 With the right teaching techniques, the average grades of participants can prove to be significantly higher for students who experience synchronous events (Strang, 2012). However, “deficiencies in synchronous collaboration competencies at best resulted in less efficient collaboration and learning” (Bower, 2011). The real issue is that you can have the best tools in the world, but if you don’t know how to use them effectively then the tools are of little value. Bower, M. (2011). Synchronous collaboration competencies in web‐conferencing environments–their impact on the learning process. Distance Education, 32(1), 63-83. Offir, B., Lev, Y., & Bezalel, R. (2008). Surface and deep learning processes in distance education: Synchronous versus asynchronous systems. Computers & Education, 51(3), 1172-1183. Strang, K. (2012). Skype Synchronous Interaction Effectiveness in a Quantitative Management Science Course. Decision Sciences Journal of Innovative Education, 10(1), 3-23.